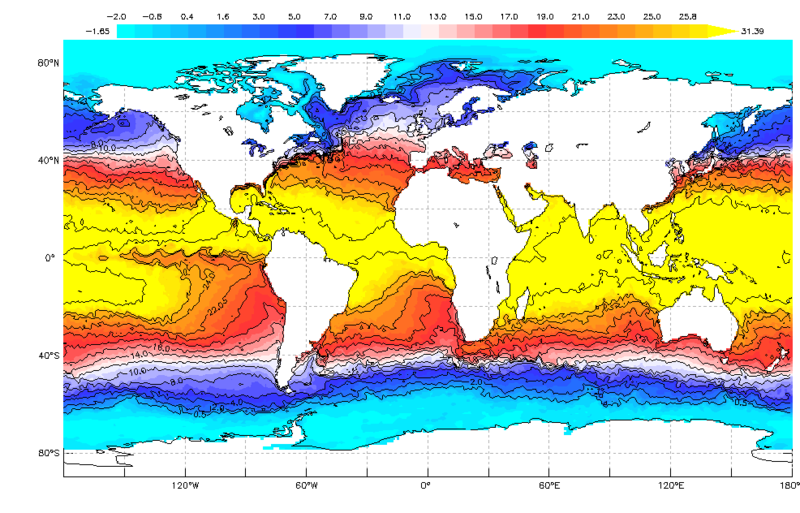 Sea surface temperature is a measure of the temperature of the very top layer of water. Scientists are not able to put a thermometer into every part of the ocean on Earth to measure its temperature. Instead, scientists use a technique called “remote sensing.” “Remote” means “from a distance.” When scientists make measurements far away from an object, that’s remote sensing. Usually, remote sensing instruments are gathering light or other electromagnetic energy from a far-away object. 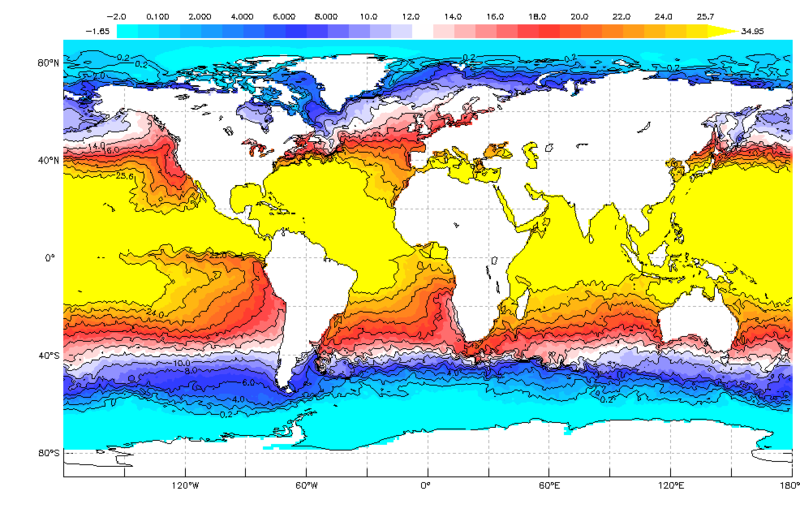 Sea surface temperature is remotely sensed by satellites. Sensors on satellites collect these data for oceans and for other large bodies of water, like seas or the Great Lakes. The satellites are far away from the ocean itself, so depending on the technique used, the measurement of the ocean surface might include a thicker layer of water, not only the very top layer. Daily sea surface temperature is averaged over one day. Note: This mini-lesson has students analyze average daily temperatures for four different months to make inferences of the seasons. Note: This mini-lesson does not imply that the data provided are monthly averages. Goal: Students observe images of daily average sea surface temperatures taken during 2017, looking for any changes that are occurring throughout the year. Have students arrange images in what they predict to be in chronological order. What changes do you see through the year? What explanations can you suggest for these patterns? Choose a location or region. During which months do the extreme highs and lows occur? What explanations can you suggest for the timing of those extremes? Which regions experience both the extreme highs and lows? Which regions don’t experience the extremes? Why do you think this happens? What differences, if any, do you find between the year’s variations over the oceans versus the year’s variations over the continents? Are there regions that remained relatively unchanged over the year? Why do you think this happens? After several minutes, ask the groups to share with the entire class their discoveries of patterns and their interpretation of those patterns.